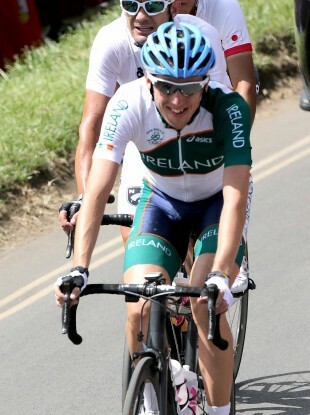 He became only the second-ever Irish cyclist to win a classic, after Sean Kelly. IRELAND’S DAN MARTIN, riding for Garmin, won Sunday’s Liege-Bastogne-Liege classic race, seeing off Spanish pair Joaquim Rodriguez and Alejandro Valverde after a gruelling 261.5 kilometres. Martin, nephew of former Tour de France champion Stephen Roche, attacked just before the final bend to come through and land the 99th edition of the ‘doyenne’ of the Ardennes classics. Martin’s mother is the sister of Roche, who won the Tour de France in 1987, and the former rolled back the years for Irish fans as he gave his compatriots a first success in the Liege since Sean Kelly 24 years ago. Sunday’s success was the biggest of his career to date for 26-year-old, Birmingham-born Martin, a gritty and talented climber. He just outlasted Rodriguez by three seconds as they hurtled for the line after the Spaniard made his final push just before the final kilometre, the champion finishing in 6hr 38min 07sec. Belgian world champion Philippe Gilbert could only trail in seventh, 18sec off the pace.”I can’t believe it,” gasped Martin. “The team protected me all day long to perfection. When I saw Rodriguez attack I had no choice — I’d have preferred to go later but I had to get on with it,” said the Irishman who was second in the 2011 Tour of Lombardy. Gilbert, who emulated Davide Rebellin when two years ago he won the three Ardennes classics in the same season, meanwhile recognised that. Email “'I can't believe it' - jubilant Dan Martin takes Liege classic honours”. Feedback on “'I can't believe it' - jubilant Dan Martin takes Liege classic honours”.